FAST FACT: "Chanel" is the nation's number-one hound and number five all-breed. in Mexico City, his enthusiastic fans stormed the ring. at Mechta), now a Japanese resident, to his U.S. championship. Norway in the World Challenge, making the final cut. is a granddaughter of the famous Bunny, the winningest Beezer of all time. 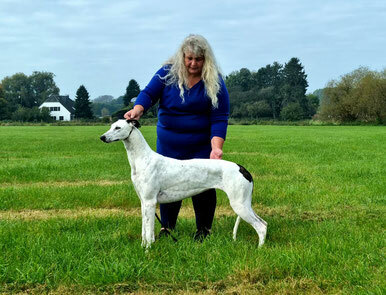 FAST FACT: This was the first time handler Andy Linton showed this 3-year-old Deerhound.